Dr. Vladimir Potepalov is a general dentist at Dental Star P.C. in Englishtown, New Jersey and Brooklyn, New York. He graduated from the University of Baku, after which he went on to attend and graduate from New York University College of Dentistry and started a private practice in New Jersey and New York. He has over thirty years of experience as a general dentist. He has continued to stay up-to-date with contemporary dental innovations and techniques through education throughout the U.S. and Germany. 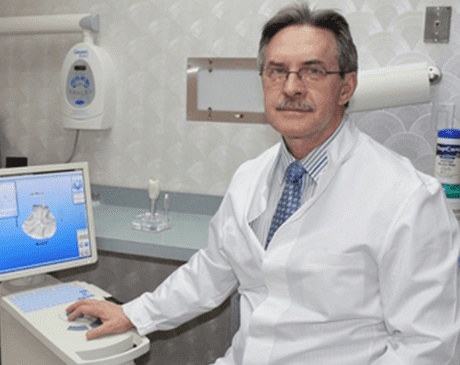 For the past fifteen years, Dr. Potepalov has been exclusively practicing in the U.S.
At Dental Star New Jersey, each patient receives the highest standard of dental care possible. He maintains advanced credentialing to stay up-to-date with the latest advances in dentistry, so patients always receive the most innovative treatment. Dr. Potepalov uses the newest CEREC machine, a sophisticated system that creates premium dental restorations using 3D digital imaging to design crowns and bridges without impressions. Furthermore, Dr. Potepalov has the ability to quickly and without pain, install dental implants with 3D XR CT scanning and surgical guides. This is by far, the safest way to install implants. Only a handful of dentists in the Tri-State area use this revolutionary technology. Furthermore, Dr. Potepalov performs onlays, inlays, and same-day or one-day crowns. Dr. Potepalov also specializes in cosmetic and full-mouth restorations based on digital dentistry, which minimizes or eliminate teeth preparation as a requirement. Most cases are resolved in up to two weeks, throughout which Dr. Potepalov will provide high-quality temporaries for patients. Dr. Potepalov also specializes in gum disease treatment through the innovative use of WaterLase technology. He uses state-of-the-art Waterlase lasers without anesthetic shots. Dr. Potepalov's procedures are painless and predictable. Results can be seen as a direct result of innovative, cutting-edge dental therapy. General and local anesthesia are available upon request, if needed. Whether patients need emergency dentistry, preventive services, or cosmetic enhancements, Dr. Potepalov ensures each patient receives the beautiful smile they deserve. Dr. Potepalov and his team exceed expectations at each and every appointment, to give patients the beautiful smile and confidence they desire. Call to book an appointment with Dr. Potepalov today or use the online scheduling tool.